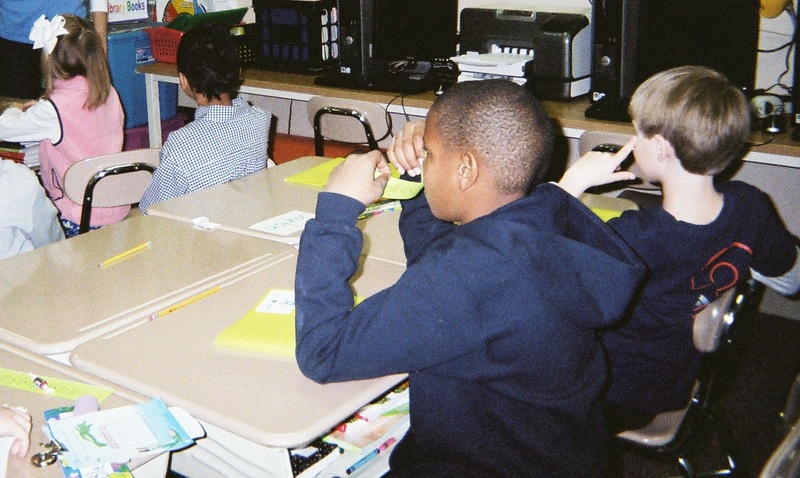 Fifth grade students quietly consider their progress in school during a self-assessment at the start of a new year. Mid-Week Focus this week falls on New Year’s Day…a great time to celebrate new beginnings. Advice for making and managing new year resolutions are easy to find. I hope this post offers an attention-getting, easy-to-use and helpful tool at the start of 2014. It’s a 4-step strategy that can help you and your older elementary school students start 2014 with a thoughtful self-assessment. This approach offers the benefit of helping children, as early as fourth and fifth grade, feel more like partners in their own education and less like young people pressed to attend school. It’s a self-assessment process that creates a learning alliance between teachers and students, asking students to look at their progress in the current school year, including how well they’re using attention skills. STEP # 1 – STOP – Give students a “heads up” ahead to let them know that everyone will be asked to stop their end-of-day activity soon to allow time for a self-assessment of their learning progress and attention skills. STEP # 2 – REVIEW – When you have the class’ attention, invite your students to silently think over what they’ve accomplished in school that week, month, or term . Review time may also include reading over a list that you’ve posted with a schedule or objectives, etc. In addition, you may offer students review questions to guide this part of the self-assessment. Better still, you may work collectively with your class to come up with effective review questions for them to use. This option will help your students develop strong organizational skills as well as strengthen the class’ learning alliance. STEP # 3 – REFLECT – Reflection is personal so you will likely want to leave this part of the self-assessment open-ended. However, it may help students to have some guiding questions for this most creative part of the process. STEP # 4 – RENEW – You want your students to feel energized by the self-assessment so that they are renewed for the day or week ahead. Some children enjoy singing after quiet, demanding work. Others enjoy physical activity like stretching to music. Every teacher has her or his own methods for sparking a sense of joy in children. Conclude the self-assessment in a way that will help students feel ready for more learning. Best time to Self-Assess – School days are always busy, but you can save time toward the end of a school day for this process. Give the class advance notice about the self-assessment. Consider extending the process over a four-day period, focusing on one step at a time to allow students to fully participate in and benefit from this learning tool. In my mind this strategy is most effective when it’s implemented on a regular basis. For some teachers that may mean weekly, monthly or end-of-term self-assessments. What strategies do you use to help yourself and your students evaluate progress in class? Please send comments. Hope you’ll stop by on Monday for Attentionology for K – 5 Teachers. ‹ Say Good-bye! Say Hello!